Glass, human tissue (the artist's cells and tissue, cultured from tissue taken by biopsy), hand-made glass bones, polyurethane, flock, rubber. In Delicacies of the Dead, Alicia King uses tissue engineering techniques used in biological technologies to transform her own cells and tissue into a contemporary techno-scientific reliquary. Delicacies of the Dead explores ideas of subjectivity, embodiment and ethics of the body and its materials as modern commodities in medical and scientific industry, through the augmentation of human tissue in sculptural form. The work references traditions of bodily ritual sacrifice through the reliquary motif, encasing human tissue fragments in a microcosm of speckled flesh; cells grown from tissue taken from a biopsy of King’s leg. The biopsy was performed by a local Hobart surgeon who removed a piece of skin (3cm x 1cm) from King’s leg. King took the tissue to the University of Tasmania School of Medicine and harvested her keratinocyte cells. Over a period of months she grew the cells into tissue membranes to form a suite of sculptural forms. 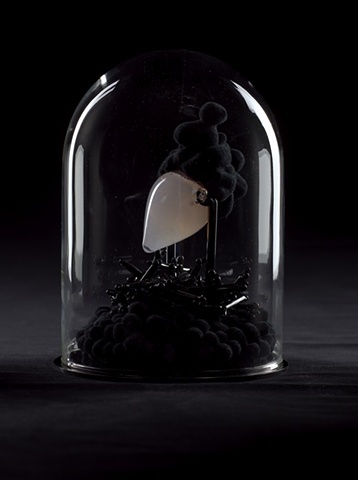 These cells were also grown in a custom made bioreactor, as a living human tissue sculpture that was exhibited with this piece at the Tasmanian Museum and Art Gallery Bond Store for the 2009 MoNA Prize, and later published by the Museum of Modern Art (MoMA), New York, in their publication Biodesign: Nature + Science + Creativity. “Human dealings with bodily materials outside of the host body are odd and compelling. Generally human material removed from the body becomes anonymous, objectified and considered to be a waste product, though it has incredible financial value as a commodity. When used in industry the individual origins of the tissue are removed and it is used like any other raw material in the factory line, completely devoid of it’s individual, subjective origins, yet newly imbued with miracle properties. 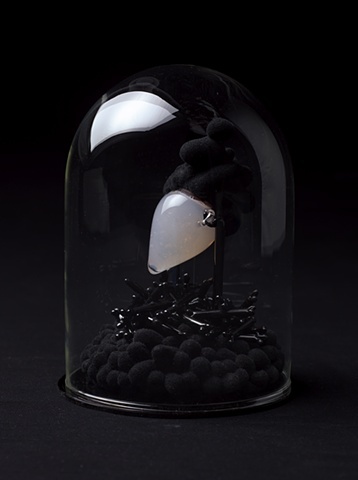 This series of reliquary artworks play upon apparent miracles of biological technology and the idea of science being able to fulfil the mythology of our mysterious existence - of the void, the meta, the unexplainable - ultimately, the future.